A hierarchical approach to clean and repair books. While this looks like a list to follow, it is only meant to be a guideline. Every book repair needs to be examined separately and the process may change for each. Just consider each point on the lists to see if they are needed. Remember, Always Test First! Practice on unimportant books before tackling your collection. 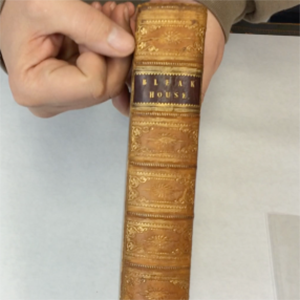 Don’t work on rare, valuable books. Consider sending them out to a professional. CLEAN (See the cleaning hierarchy) Test first! Be gentle. Don’t use harsh chemicals because they might make the colors run or destroy the foil stamping. COLOR (Colored pencils or acrylic paint mainly) Less is more! Color in the lines. No halos! Try to only color new materials or areas where the color is damaged. CORRECT (Line it up) The text-block and cover need to be square and the pages lined up. Nothing should be upside down. PASTE or Glue. There is a difference! )Paste is very wet and dries hard. Glue is dryer and dries flexible. (Good quality glue that is.) Glue frayed areas or separated layers or whatever you are adding to the book. Why is there a hierarchy at all? If you color first you can’t clean without endangering that color. If you glue or apply any protective sealant first, then the color can’t soak into the fibers. If you glue things in place before you straighten them up they will stay crooked. There are always exceptions. Be sure to test in an inconspicuous location such as the rear turn-in. Clean: Remove things such as previous repairs, fragments of paper or bits of hard glue. Color: Color the Japanese tissue or other materials as needed. Correct: Line up the pages and text block. Paste: Solidify anything that was askew, then attach any new materials such as tissues using paste or glue or a mix. Protect: Dry thoroughly before closing the book. Keep waxed paper in the shut hinge awhile or at least rub the area through waxed paper carefully. Color: If needed, color (tint with colored pencils) a piece of Japanese tissue before applying the tissue to the tear. Correct: Line up the scarf edges of the tear so it is correct with the recto bits on the recto side and the verso bits on the verso side. Paste: First tear the tissue to the right shape. Use paste not glue on pages. It is ok to use glue right along the inner 1/8th margin to reattach pages. Protect: Dry thoroughly and rub with wax paper a bit. Don’t use tape. Even archival tapes can be hard to remove. Don’t create a repair stronger than the paper you are repairing. Clean: Eraser, knife, sandpaper. Be sure to have a flat clean board slipped under the page you are working on. Correct: Really there shouldn’t be anything to align in this application. Protect: Rub area with wax paper to flatten out the fibers. Don’t get rid of important marks that indicate provenance. For Cloth books mainly. Leather books have some additional points. DRY: Eraser, Knife, Sandpaper. Use an eraser, work in small circles with light pressure. If more is needed you can use something sharper. The micro-spatula can be used to scrape the cloth. Sandpaper can also be useful in some instances. Test an inconspicuous area. All of these methods may remove some of the color. The scraped areas can be re-touched using colored pencils or acrylics. This is definitely something to try on a practice book. ALCOHOL: Simply add some (10-20%) isopropyl alcohol to some water and then humidify a cloth. Chemicals wiped onto book-cloth can just get stuck in the fibers and may degrade the cloth over time. The exception is coated cloth that has a plastic element to it. Plastic, of course, can be wiped with your standard kitchen cleaners. WET: Use a simple humidified cloth. If you squeeze the cloth, no water should drip out. CHEMICAL: Occasionally something like lighter fluid (naptha) or bestine will help clean a cloth binding. Test in an inconspicuous area. Only use in a well ventilated area. Clean: It depends on the type of cloth: Try Eraser or Damp cloth wiping then Knife scraping if necessary. Test first! Color: Less is more! Use acrylics or color pencil. Touch up black lines with archival pens. Correct: There may not be anything to align in this application. Maybe a folded over book-cloth area. Paste or glue any frayed places as needed. Protect: Add “Mylar” polyester film covers that are .oo5 mm thick. Or possibly apply an archival sealant such as Micro-crystalline Wax or possibly an archival spray fixative if you used coloring to keep the colors from smearing. Don’t use harsh chemicals because they might make the colors run or destroy the foil stamping. Color: Before coloring scuffed leather, apply Klucel-G aka Cellugel(brand) to keep it from absorbing too much moisture. Correct: Probably nothing needs to be aligned if the leather is undamaged. Paste: Carefully! Too much moisture and pressure can damage the leather. Probably use Glue rather than Paste if anything needs attaching. Protect: Hewit’s leather dressing which is an archival esther wax that looks like milk. Don’t use actual milk, hand lotion or any oil-based products. Test first. This may not work well on Goatskin. Note the change from the other hierarchies. Clean/Protect is added at the beginning. Clean/Protect: Don’t use regular methods. It will only make things worse. Moisture will turn it black and make it crispy. Possibly scrape off icky bits with a knife and then use Klucel-G to seal the area (possibly the whole cover). Undamaged leather can be cleaned with a white polymer eraser such as Staedtler Mars. There are liquid soaps that can be used for leather but cleaning in general is not recommended unless necessary. Color: Only after Klucel-G application. Only on the damaged areas. Less is more. Correct: Line up the pages and text block as needed. Paste: Paste is frequently the wrong thing to use for repairing damaged leather because paste is too wet. Use Glue instead as dry as possible. Protect: SC6000, which is a thick pasty archival wax, is good for sealing really rough areas. Hewit’s Leather Dressing which is an archival anionically stabilized emulsion of hard ester wax. This is good for undamaged leather. Test first always. Don’t use anything that is wet on damaged leather or suede. Foxing: Learn to love it. To get rid of it, aqueous sun bleaching is the only conservator recommended safe method and is time consuming and expensive. Water stains: Sometimes just bathing the page in warm water will do the trick, however it has to be separated from the book. Mold: If you really just can’t throw it away: Brush mold off outside. Don’t breathe it in! Wear a mask. Wipe area with 99% Isopropyl alcohol. Wax it if possible. Keep it away from all other books and be sure it is in an environmentally controlled area or the mold will just grow again. Ink and other stains: Send it to a conservation lab where they can use a suction table and chemicals to remove it. Glue the flyleaf to the paste-down. Flyleaves are typically only attached with a thin strip of glue and are not sewn in so they will just pop off and not fix the problem.